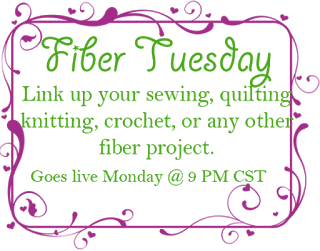 Welcome to another Fiber Tuesday Link Party! 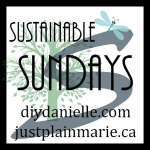 I enjoyed your links last week, and I look forward to seeing your inspiring projects this week! I have been busy getting the last of my NICU donation projects posted (click photo to view). 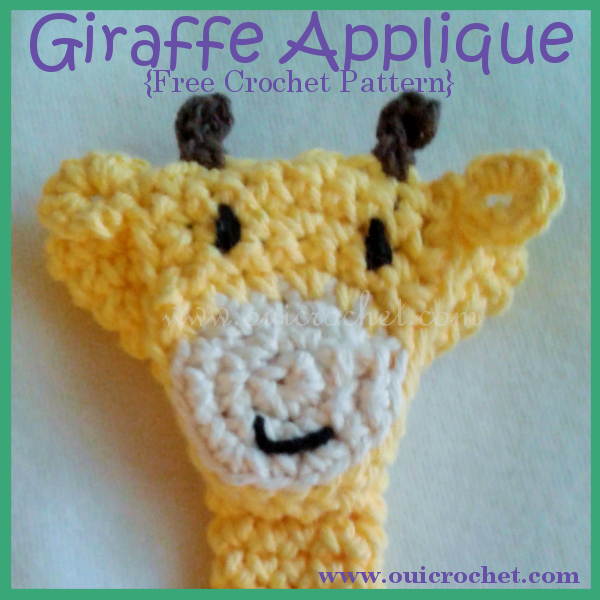 My Giraffe Applique winds up the series, and went live today. 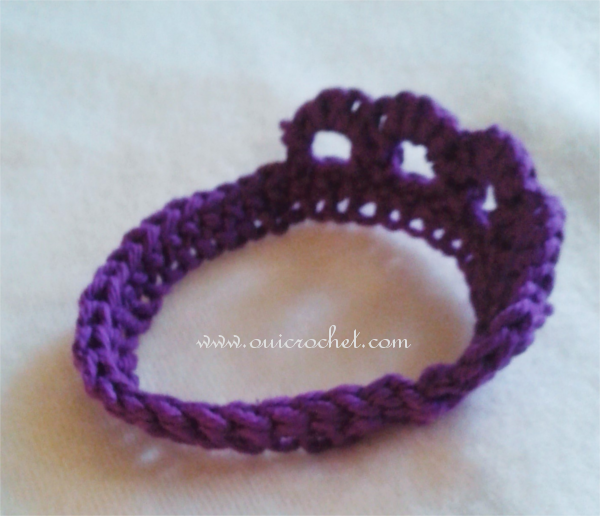 I have also been crocheting some lovely headbands that I will begin sharing this week. You won't want to miss them! 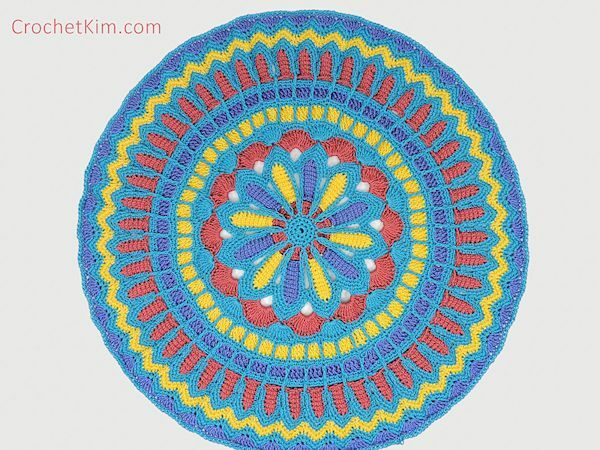 Kim Guzman at WIPs 'N Chains for her stunning Turquoise Mandala! 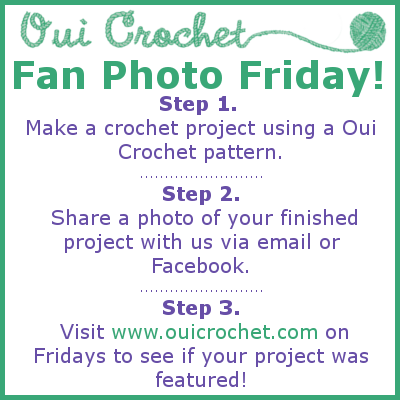 We would love for you to help our party grow by inviting all of your fiber-creative friends! It is wonderful to get together and inspire each other! 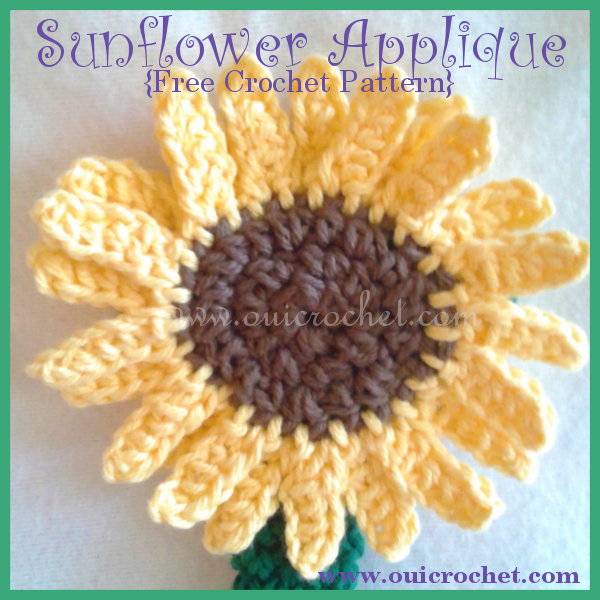 Does this Sunflower Applique look familiar? You may have already seen it on my Sunflower Stethoscope Cozy. I like this sunflower so much, that I felt it is worthy of it's own post! 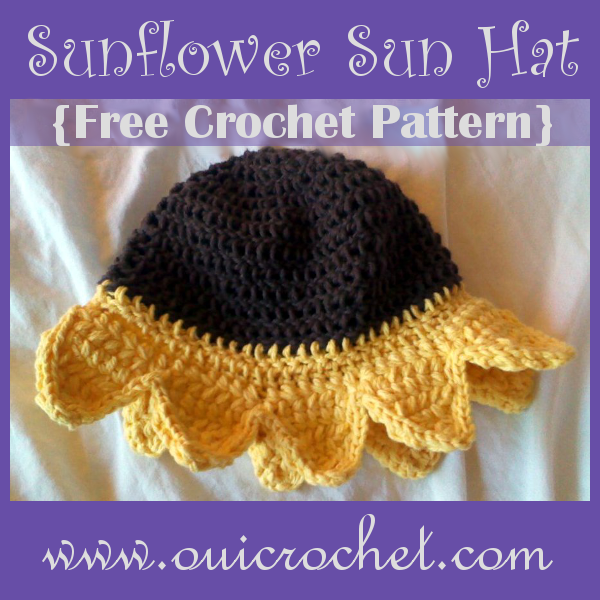 This sunflower applique is similar to my other sunflower appliques, but this one has a larger center and a fuller appearance. Once made, you can hand shape the petals, alternating one to the front, and one to the back. It givews the sunflower a nice, layered look. The petals of the sunflower can be spritzed with a water/cornstarch mixture, hand-shaped, and left to air dry overnight, if you wish. This will help them to hold their shape better. 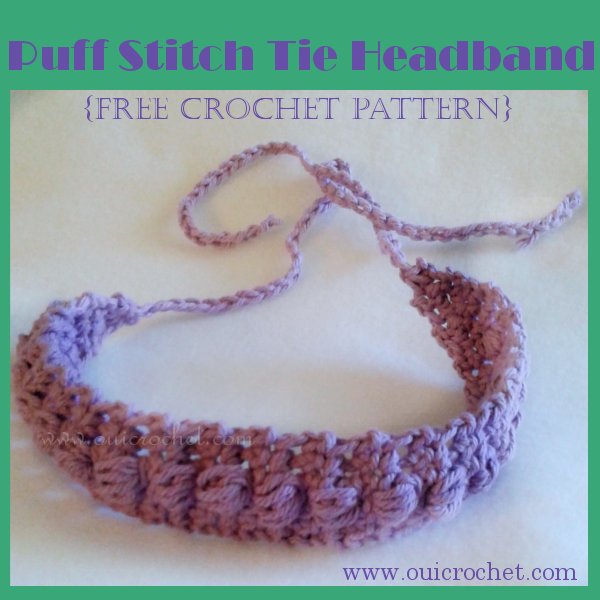 With your H hook, and brown yarn, ch 4, join with slip stitch (sl st) to form a ring. Join Yellow yarn to first st in round. Petals: [Ch 6, sc in 2nd ch from hook, hdc 2, dc 2, join to next st of center with sl st.] Repeat around for 24 petals. 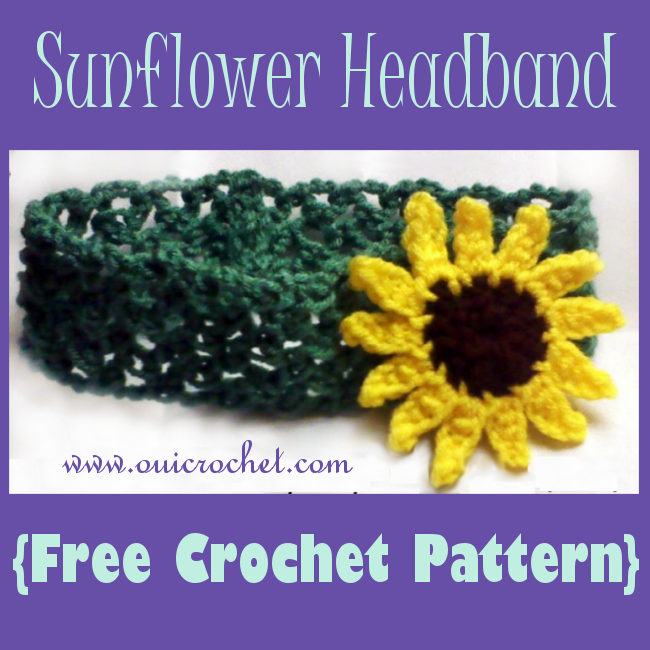 What would you use this sunflower applique for? 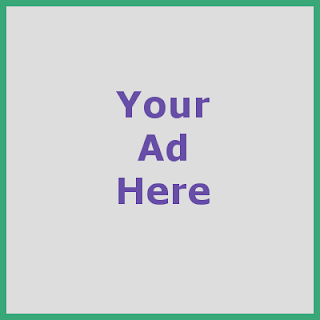 Leave a comment and share your ideas! 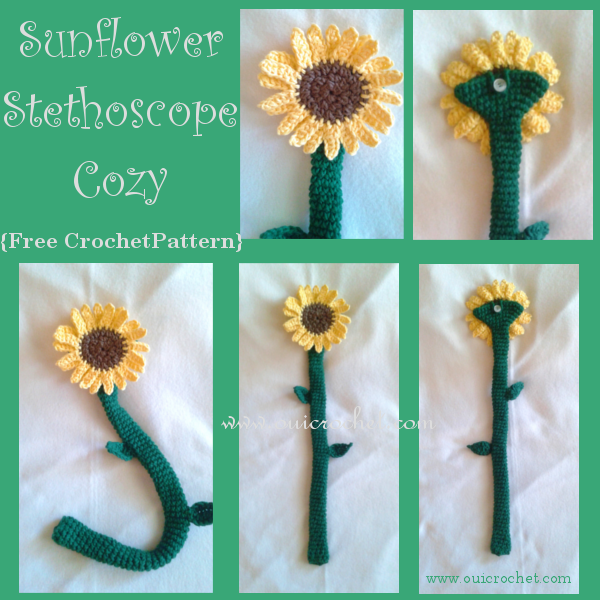 Have you seen my Sunflower Stethoscope Cozy? Well, I made a Giraffe, too! This giraffe is patterned after Valley Children's George the Giraffe. You could easily change the blue hearts to brown spots, if you like, but aren't the hearts so cute? The basic stethoscope cozy is the same as the one I used for the Sunflower Stethoscope Cozy. 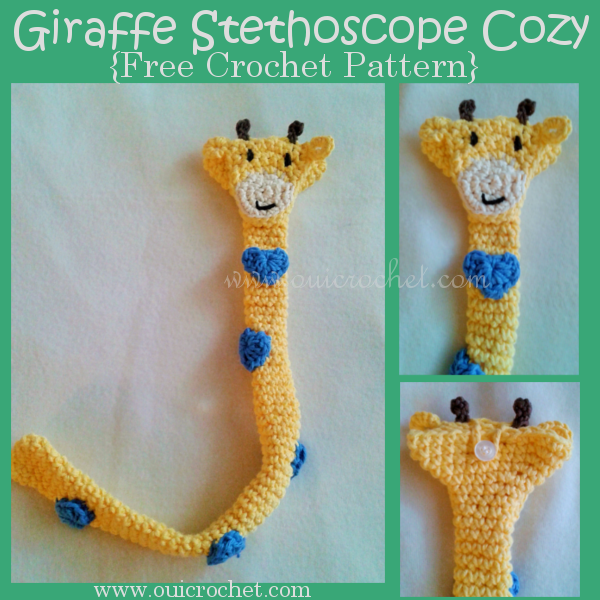 But for the Giraffe Stethoscope Cozy, I simply used a giraffe applique. See how easy it is to customize the cozy to whatever you want? Some argue that stethoscope cozies are "germ magnets" and can make patients sick. Others argue that the stethoscope cozy does not touch the part of the stethoscope that comes in contact with the patient, so it is safe, as long as it is properly laundered. Ones who take the "pro cozy" stance liken the cozy to a piece of clothing that gets washed before being worn a second time. They say it is no different than their uniform. While they can make great gifts, it is best to check with your intended recipient's office, to see if they have rules regarding stethoscope cozies. 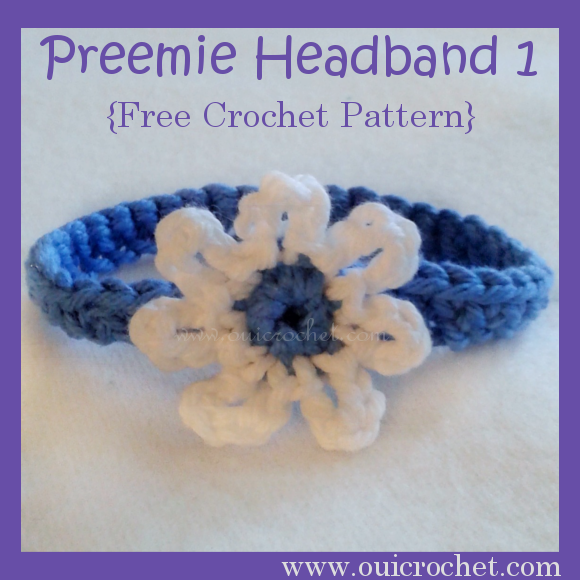 Special Instructions: This pattern is worked in a spiral. We do not join rounds. We will mark the first stitch of the round, and move the marker up with each round. With your K hook, ch 10 Join with slip at to first ch to form a ring. Round 75: sc 6, ch 7, skip 1 stitch, sc in next stitch (button loop made), sc 22, slip stitch to first sc. I made blue hearts, so that they would match Valley Children's George the Giraffe. 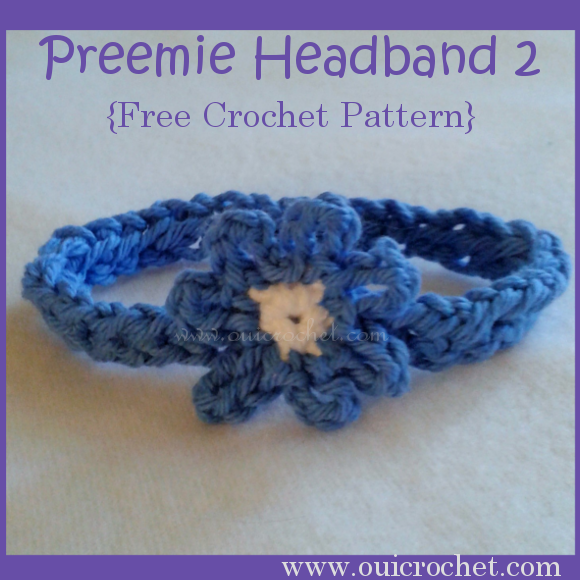 I used the Tiny Crochet Heart pattern from Scattered Thoughts of a Crafty Mom. 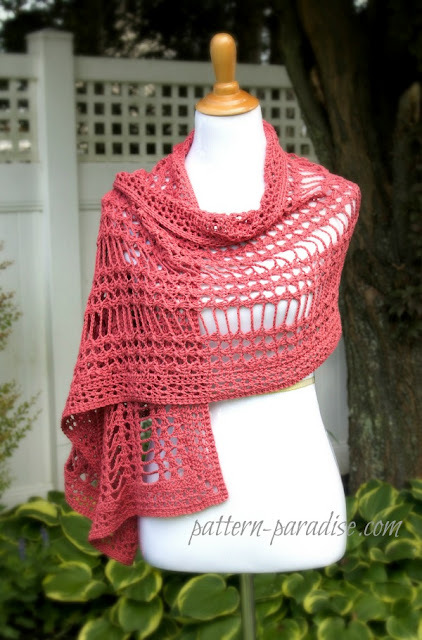 Pattern Paradise for this beautiful X-Stitch Summer Wrap! 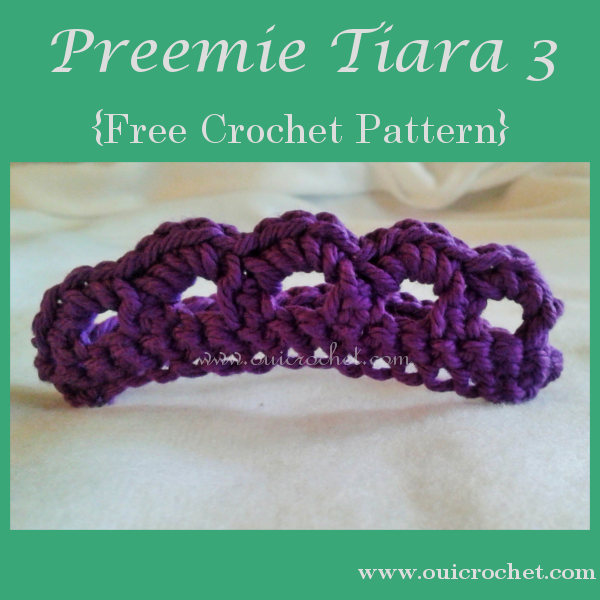 Today I am sharing the third and final Preemie Tiara pattern from my collection of crochet donations to the Valley Children's NICU. Preemie Tiara 1, Preemie Tiara 2. Now that you have seen all three, which is your favorite? 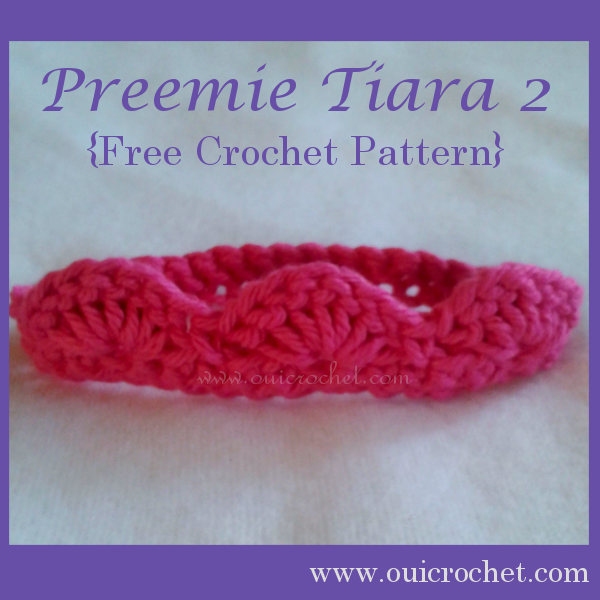 Preemie Tiaras are very quick and easy to make, and they are oh so adorable! 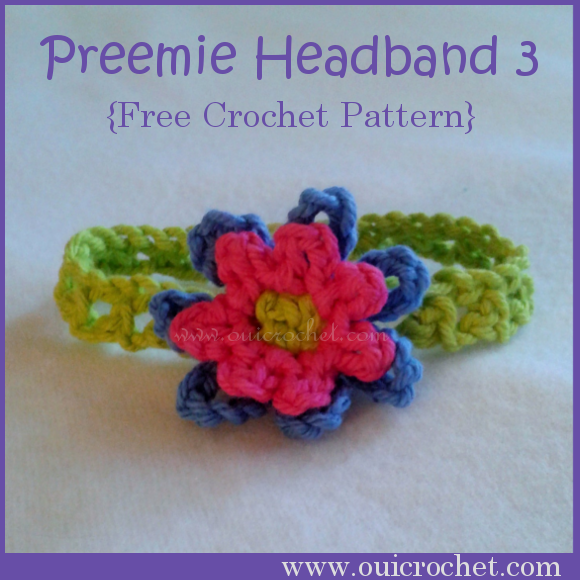 Adjust the size, slightly, and you can make them for all of the newest little princesses in your life. If you aren't sure about the size you need, you can always print out my Hat and Headband Size Chart, to keep on hand. It includes preemie sizes. Ch 38 join with sl st to first ch to form a ring. Round 1: Ch 1, sc in same ch as join, and in each ch around. Join with sl st to first sc. Round 2: Ch 1. sc in same st as join, *ch 3, skip 1,** sc 2. Repeat from * 4 times, ending your last rep at **, sc in next st. Turn. Round 3: sc 3 in the first ch 3 space, sc 5 in each of the next 3 ch 3 spaces, sc 3 in the last ch 3 space, sl st in the next st.Finish off and weave in ends. 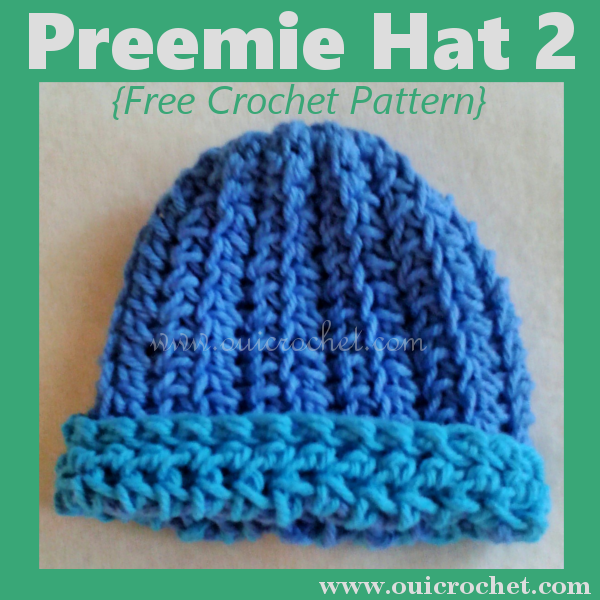 Here is the second Preemie Hat in my Preemie series. 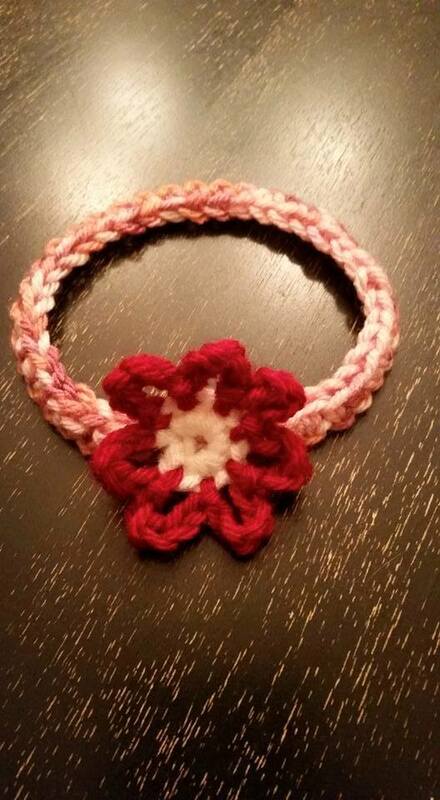 Only one of this style made it into the package of crochet donations sent to the Valley Children's NICU. 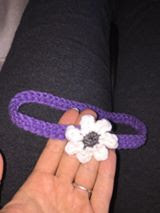 Not because it isn't as good of a hat, but because I simply didn't have time to make more! Although I have not timed how long it takes to make, it does seem to take slightly longer than the other hats. I wanted to include it though, because it is always nice to have a variety of styles. 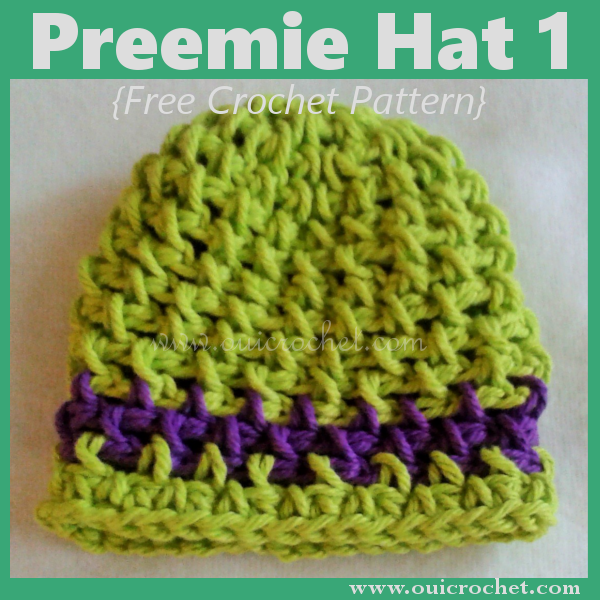 The first Preemie Hat Pattern that I shared was made in a round, crown to brim. 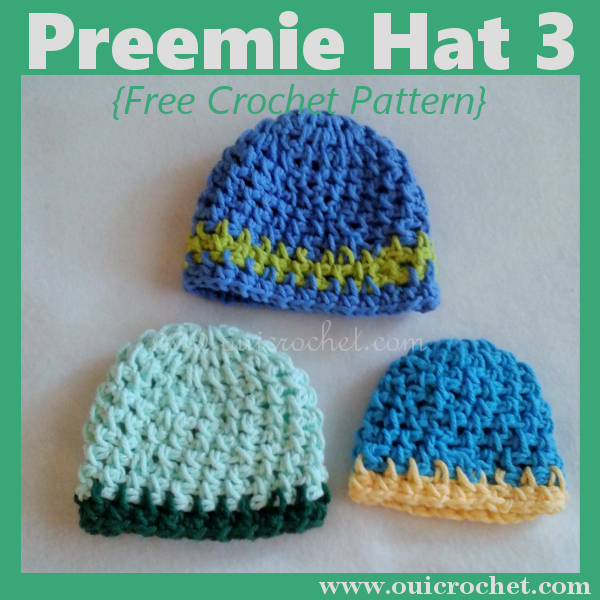 This Preemie Hat is made lengthwise, with a brim added at the end. One of the things I love about this method of construction is that it is much easier to adjust the sizing. 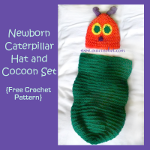 You can easily make the same hat for a micro-preemie, all the way up to adult sizes. Just adjust the length and number of rows you make. 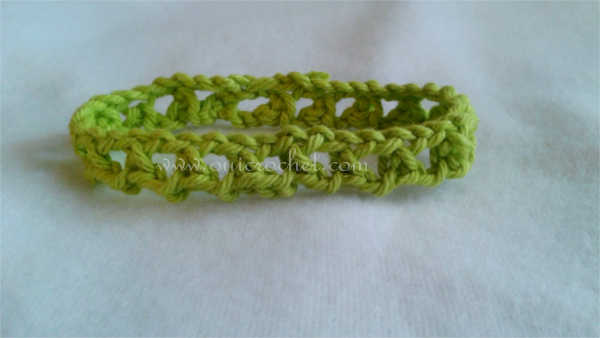 The basic stitch of each row is a half double crochet (hdc). Just add more or fewer hdc stitches to adjust the length, depending on the size you need. 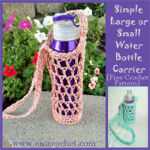 At the crown, we switch to single crochet so that it is easier to gather to sew closed. 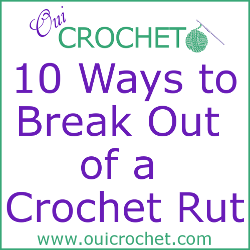 For the tiny hats, you will want fewer single crochet stitches in the row, and for larger hats, you will want to add a few more. Special Instructions: We will be working in the back loop (bl) of each stitch, to get a ribbed look. This also adds a little more stretch to the hat. Note: The bottom trim of the hat does take a little of the stretch away. 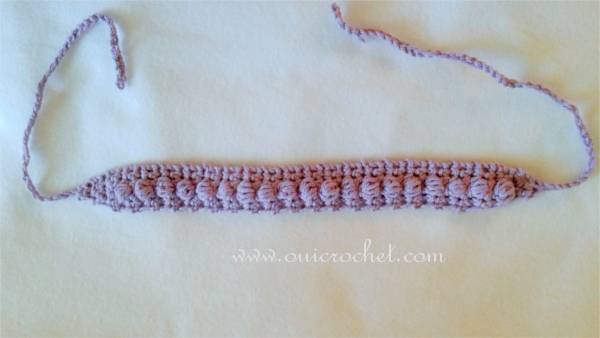 If you wish to omit the bottom trim, simply increase your ch and hdc stitches by 3-4 sts. This will allow the hat to keep a little more stretch. With color A, ch 17. Row 1: hdc in 3rd ch from hook, hdc 10, sc in last 4 ch. Turn. Row 2: Ch 1, working in the back loop (here and throughout), sc 4, hdc 11. Turn. Row 3: Ch 2, (continuing in the back loop) hdc 11, sc 4. Turn. Rows 4-20: Repeat rows 2 & 3. Join: Line up your stitches, and working through the back loop of the last row made and the unworked side of the foundation chain, slip stitch in each across. Weave the tail through the top (sc) edge, pull tight and knot. 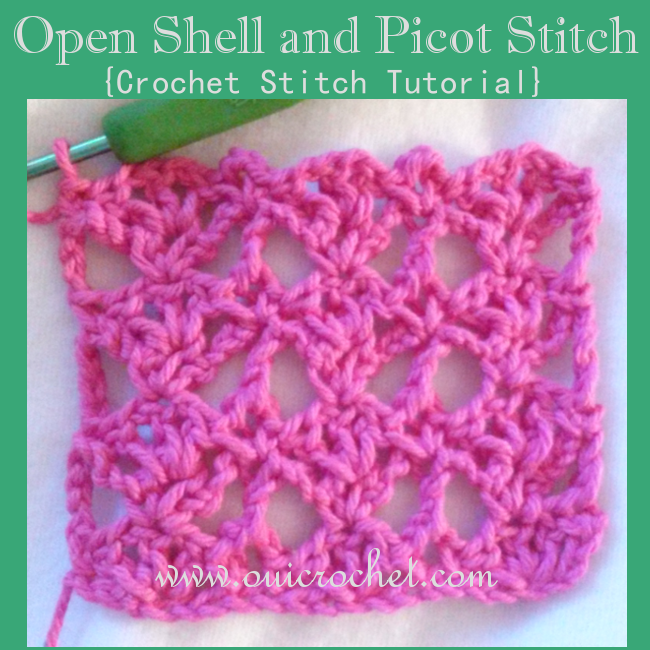 Use your yarn needle to sew completely closed. Attach color B to the brim of the hat, next to the side seam. Row 1: Ch 2, hdc 25 evenly around brim. 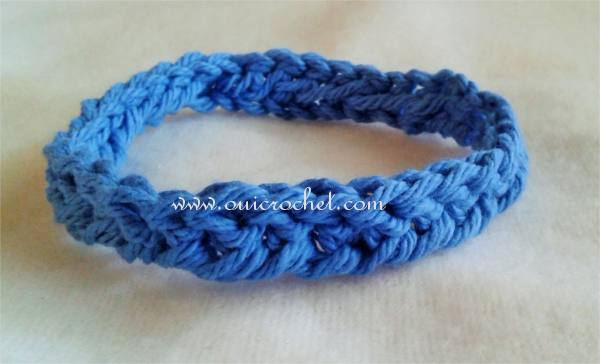 Join with slip stitch to the first hdc made. Row 2: Ch 2, hdc in the back loop of each stitch around. Join to first hdc with sl st.
Row 3: Ch 1, sc in each st around. Join with sl st.